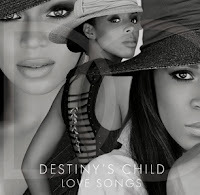 Destiny's Child will release their first new song in eight years as part of a new compilation of their most romantic tracks, aptly titled, Love Songs. The new track, "Nuclear," was produced by Pharrell Williams, who co-wrote the song with Michelle Williams, James Fauntleroy and Lonny Bereal. Beyoncé and Bereal also contributed vocal production. Love Songs is scheduled for release on January 29th, and along with "Nuclear," will feature Destiny's Child hits and favorites including "Brown Eyes," "Now That She's Gone," "Cater 2 U" and Timbaland's remix of their classic "Say My Name." After a fruitful, hit-filled career, Destiny's Child split up in 2005, with members Beyoncé, Wiliams and Kelly Rowland all moving on to solo careers in music and, sometimes, acting.